Deep Work: Rules for focused success in a distracted world. This book has changed how I work since I started looking through it a couple of weeks ago. Summary: What are my friends sharing on Facebook? Who is trying to get hold of me in email? What is happening in the world? These questions constantly pull many of us away from deep focus and into quick, shallow dips into a wide range of topics. We forget how much pleasure and productivity results from even a half hour of completely focused work on one topic or project. Thoughts: This isn’t really a book review because I didn’t read the whole book. I skipped the first part that made the case for increased focused and reduced distraction. I figure that anyone over age forty knows why these are good things because we remember doing deep work before the World Wide Web made computers so appealing and before smart phones were ubiquitous. I chose among various suggestions in the second part of Deep Work what I thought would work for me. The visual note on the left is my reminder of what I’m committing to change so that I can do more deep work. I took Newport’s suggestion to schedule my internet time in order to break my bad habit of drifting toward Facebook “at the slightest hint of boredom or cognitive challenge” (p. 162). For me, a side effect is that I found myself having thoughts of things I wanted to do, but couldn’t, because I wasn’t allowing myself to be on the internet. I quickly got in the habit of writing those things down. By the time my next internet session rolls around, I have a to-do list to complete. Once that’s done, it’s time to get off again. 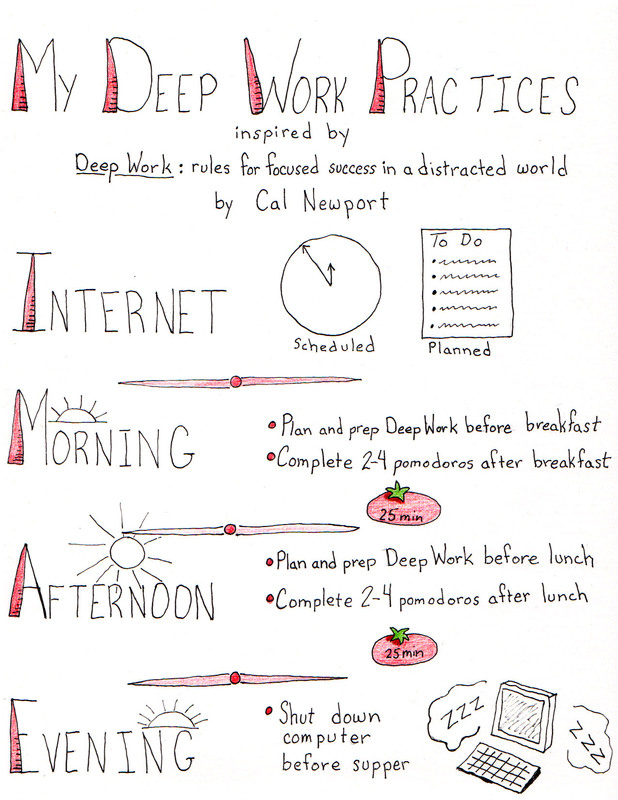 The new habits I’m developing as inspired by Deep Work by Cal Newport. Click the image to see it larger. I know from experience that my best work times are right after breakfast or lunch, but that I also have a bad habit of coming back to my desk and checking what’s new on the Web. What is working for me is to make a plan before I leave my desk so that it’s already to implement when I’m ready to work. Newport doesn’t mention pomodoros, but they work really well for me to structure my work in short, focused bursts. With Deep Work, I’m generally avoiding the internet on my breaks between pomodoros — much better to fix a cup of tea or do a few stretches. To do deep work, we also need to take time away from work. And, not spend that time browsing mindlessly. To get myself out of that habit, I’m shutting down my computer before supper. My evenings are about cooking, my husband, movies, and books. Appeal: Deep Work will be helpful to any one looking for more focus and more fun in your work. In the two weeks since I started looking through this book, I’ve had some of the best work times that I can remember. I love the idea of shutting down the computer before dinner. Of course I write this as I sit reading your blog and replying here at 9 pm. I definitely know I need to create some new Internet habits. I read this! I really like the premise of the book and his blog is fascinating reading for me in general- I am a librarian too, so I think it resonated with me on lots of levels both personal and on the job.